The closing date for applications is Thursday March 14th 2019. Late entries will be accepted if space permits. Some indoor stands will be on grass in marquees. Maximum height for the majority of indoor stands is 8’. However some higher stands can be accommodated, these will be on a ‘first come, first served’ basis and should be requested at the time of booking. No caravans allowed within the marquees. Boundaries of your site will be marked, please be careful not to encroach on your neighbours. No exhibitor will be allowed to arrange their stand or place their sign in such a way as to obstruct the light or to inconvenience or affect the display of any other exhibitor. If your stand has solid sides that might affect neighbouring stands then the organizer must be informed at the time of booking. Only or mainly products and materials relevant to agriculture or related industries can be exhibited. Please be sure to bring your passes, including vehicle passes as the gate staff will have been briefed that anyone arriving on site on June 18th without a pass will be directed to the public car park and have to pay an admission charge. No refunds will be given. Extra passes are available in advance at £5 plus vat. No passes are needed for access on June 17th. Exhibitors are responsible for the removal of refuse from their stand. Bags will be provided. No generators on site. Electricity can be provided for indoor and outdoor exhibitors. Please provide a fire extinguisher for your stand. Access for the erection of stands is from 10am to 7pm on Monday June 17th and from 7am to 8.00am on Tuesday June 18th. A telehandler will be available on Monday to unload heavy items but at exhibitors own risk. Anyone needing access outside these times must contact the organizer to arrange. All vehicles must be removed to the exhibitors car park by 8.30am. No vehicles will be allowed on site after 8.00am. A security guard will be on site overnight on Monday June 17th. Stands are to remain open until 5pm. Sub-letting of stands is not permitted. No person other than the exhibitor who has been allocated space will be allowed to sell or display articles on the stand. Sole catering and bar rights have been granted. 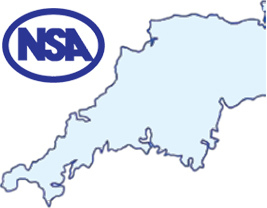 Every applicant is subject to the conditions affecting NSA Sheep South West 2019. Responsibility of Exhibitors. The National Sheep Association (The Association) will not be responsible for any accident, damage or loss however caused, which may occur to any exhibitor or his animals, articles or property brought onto the site. The Association will not be responsible for any actions or expenses on account of or in respect of any such damage or injury caused. All Exhibitors must have Full Third Party Liability insurance and will provide proof of the current policy to the Association if requested. All exhibitors indemnify the Association from any claims in connection with the exhibitor’s staff, equipment, display animals or vehicles. THE DECISION OF THE ORGANISING COMMITTEE REGARDING THESE CONDITIONS WILL BE FINAL. The closing date for applications is Thursday March 14th 2019 for guaranteed inclusion in the programme. Late entries will be accepted if space is available. Breed Societies will be housed in marquees on grass. Boundaries of your site will be marked, please be careful not to encroach on your neighbours. No exhibitor will be allowed to arrange their stand or place their sign in such a way as to obstruct the light or to inconvenience or affect the display of any other exhibitor. If your stand has solid sides that might affect neighbouring stands then the organizer must be informed at the time of booking. Maximum height for indoor stands is 8’. There will be limited space for stands exceeding 8’ & these will be allocated on a first come, first served basis. No caravans allowed within the marquees. If possible sheep should be delivered to the site between 4pm and 7pm on Monday June 17th. Access will also be possible between 7am and 8.00am on June 18th. Be sure MV or Non MV status is stated on the entry form. Please be sure to bring your passes, including vehicle passes (2 per exhibitor) as the gate staff will have been briefed that anyone arriving on site on June 18th without a pass will be directed to the public car park and have to pay an admission charge. No refunds will be given. Passes are needed by people supplying sheep to your stand. Extra passes are available at £5 plus vat but must be purchased in advance. No generators on site. Electricity can be provided for exhibitors. Access for the erection of stands is from 10am to 6pm on Monday June 17th and from 7am to 8.00am on Tuesday June 18th. A telehandler will be available on Monday to unload heavy items but at the exhibitors own risk. Anyone needing access outside these times must contact the organizer to arrange. All vehicles must be removed to the exhibitors car park by 8.30am. No vehicles will be allowed on site after 8.00am.